Dripping Springs ISD is committed to ensuring the most appropriate educational setting for each student. Our Gifted and Talented (GT) Program is designed to meet the needs of students who exhibit significantly advanced intellectual ability. The program provides appropriately differentiated curriculum presented in a way that offers greater depth, more complex content, and extensive enrichment activities designed to challenge GT-identified students. Dripping Springs ISD has established a thorough assessment process to identify students and ensure they are placed appropriately into the program. Students must first be referred for GT consideration. This is an open system with referrals accepted from principals, teachers, parents, guardians, students (both self and peer), psychologists, counselors, librarians, administrators, and community members. Parents must complete the referral form found at the bottom of this page for permission for assessment for the GT program. All students referred for GT assessment will complete a testing process. Testing instruments are approved by the district, are aligned with best practices, and are appropriate to the student’s grade level. Parent and teacher evaluations may be included in the assessment process. Parents and teachers rate the student on a variety of areas including vocabulary, expression, mastery levels, critical thinking, reasoning skills, reading level, observation skills, and problem-solving. The assessment results are evaluated by the Dripping Springs ISD GT Assessment Committee. The committee may consider additional evaluation criteria including student portfolios, anecdotal information, and other relevant data. The GT Assessment Committee makes the final determination as to whether or not the student is accepted in the GT program. Students who were identified as gifted in their prior district and whose previous district’s GT identification process measures abilities comparable to DSISD’s assessment requirements will be placed in the DSISD GT program. Students who were identified as gifted in their previous district and the prior districts assessment procedures does not meet DSISD’s GT identification requirements will be administered the NNAT 3 as a screening instrument. Students meeting the district standard on this screening assessment will be placed in the appropriate GT program immediately. Students new to the district identified as gifted in their previous district who do not qualify based on comparable assessments or by score on the screening instrument may be referred for further assessment according to the district assessment guidelines and the GT Assessment Committee. GT assessment for previously identified new students will be completed within six weeks of enrollment and placement will be adjusted as determined by the campus/district GT committee. Incoming transfer students should present any prior testing paperwork from their previous district when requesting testing for our gifted and talented program, specifically SAGES, CogAt, and/or NNAT scores. 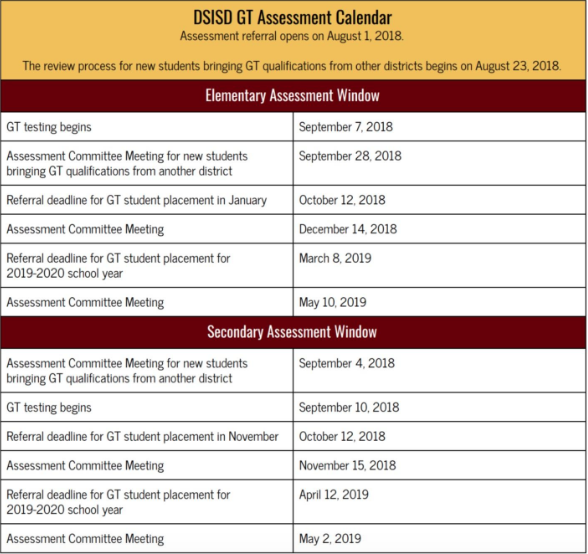 GT assessment process for the new school year will begin during the second week of school for all campuses. Below is the testing window for assessments performed during the 2018-19 school year.